Debilitating illnesses are difficult to deal with, but you can ease that process by enacting an advance directive to specify which treatments you want in case you are too sick to communicate. Doing so can relieve your family from making emotional treatment decisions like whether to discontinue life support. 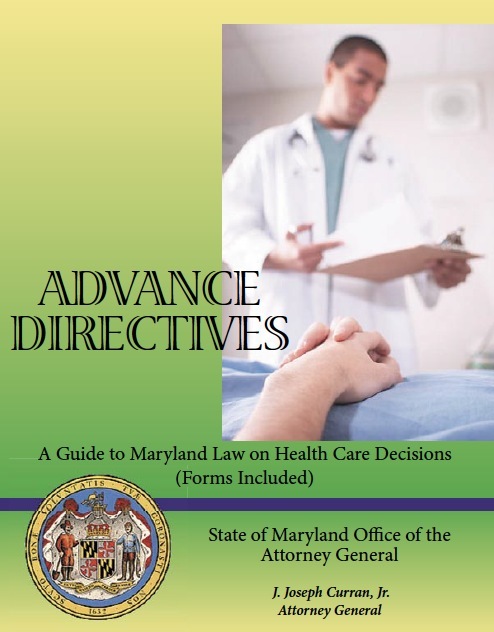 In Maryland, there is a separate form to authorize an agent to act for you regarding health care. This authorizes the agent to consent to or refuse any medical treatment or procedure doctors recommend, and to choose which healthcare facilities to use and which healthcare professionals to hire. Another section allows you to specify decisions your agent cannot make. It is important for your agent to understand your values so that he or she can make decisions according to your wishes in addition to being in your best interests. In the event that you have a terminal condition that will imminently result in death, another directive called the living will allows you to state either 1) that you would like to receive any treatments to extend your life as long as possible, 2) you would like to die naturally but still receive artificial nourishment, or 3) that you would like to die naturally and receive no life-sustaining treatment.